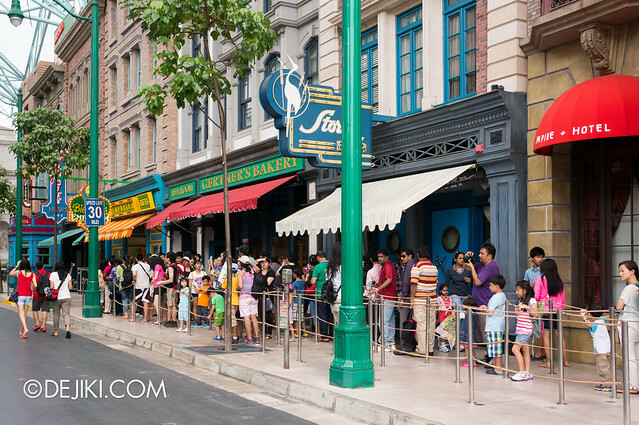 Expect to wait at the exterior line at Sesame Street Spaghetti Space Chase, with wait-times between 20-50 minutes during peak days. A few months ago, the Popcorn-a-saurus stall moved to the other end of Jurassic Park (nearer to Far Far Away). Now this is a nice rest area that looks into Ancient Egypt. It is also handy shortcut to Jurassic Park Rapids Adventure. Just walk in and turn left. It’s quicker than going through the main gate if you are walking from Ancient Egypt. 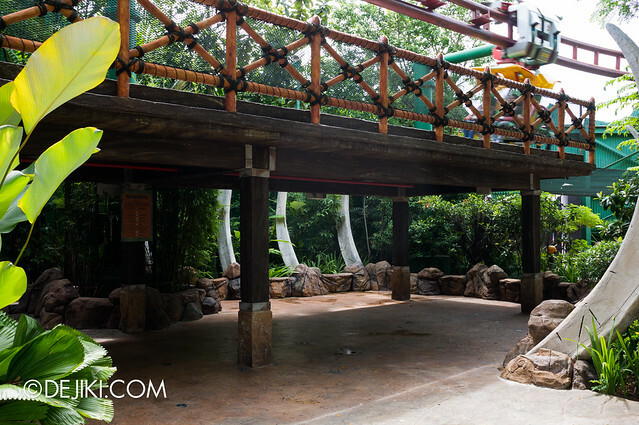 Nothing new to report at Jurassic Park Rapids Adventure, except that the efficient loading/unloading procedures often mean that small miscellaneous items (park maps, water bottles, hats) get left behind for the next group. 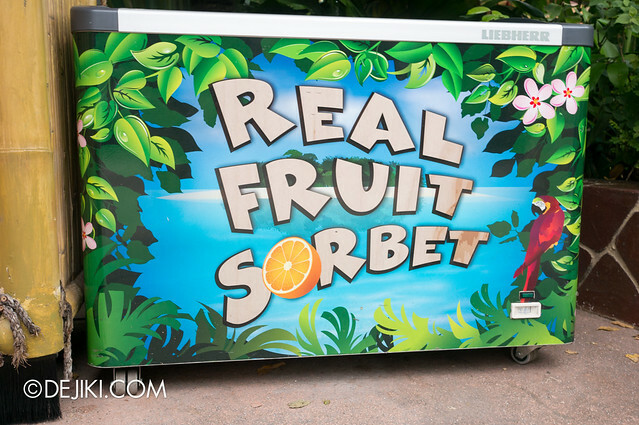 The park may think otherwise, but I feel that this ride is long overdue for another refurbishment or enhancement works. A lot of effects were not working or not operating as effective as before. The small sheltered queue section of Canopy Flyer has been emptied. Mysterious. 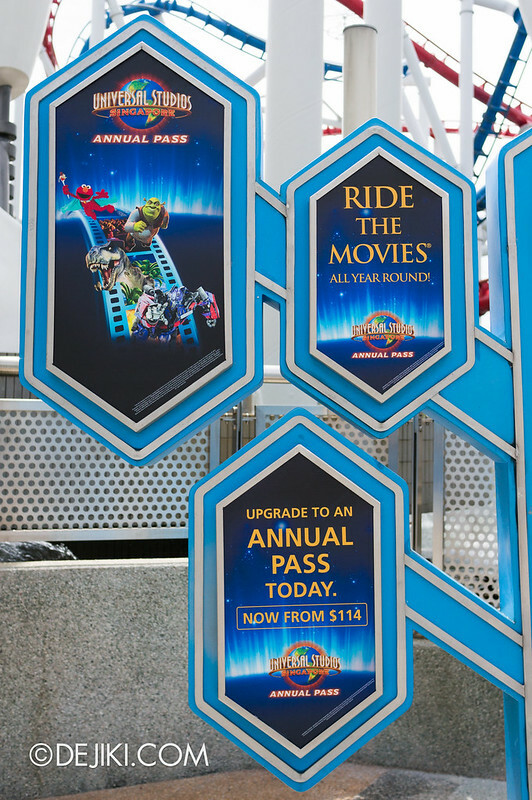 The cool annual pass signage, that is themed to Sci-Fi City, has been replaced with the updated branding – looking rather generic. View of Far Far Away (and other areas of the park) from the Far Far Away Castle (Shrek 4D queue/show building). I watched Shrek 4D (needed a place to dry off after Jurassic Park Rapids Adventure) and am quite surprised that: The pre-show is still a torture, and that there are too many malfunctioning (read: completely non-moving) seats in the main theatre. There are actually people at Donkey Live! The park’s new attraction, due to open in Late 2014 ~ Mid 2015 will be built around here. Well, I’m hoping that this area leads to Universal Studios Singapore’s Wizarding World of Harry Potter. NOTE: Resorts World Sentosa and Universal Parks and Resorts have no plans to bring Wizarding World of Harry Potter to Singapore. 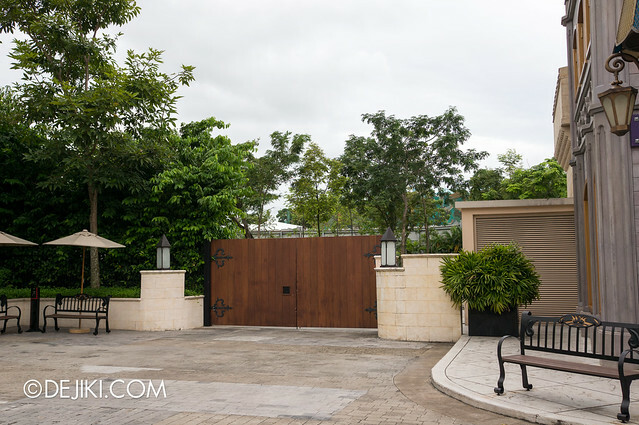 Despite the mainstream and lasting popularity of the Harry Potter franchise, RWS does not appear to be interested in any major expansion – especially with the large investment involved (purchase of land area outside of the Sentosa IR lot would be necessary, as well as the necessary licensing). 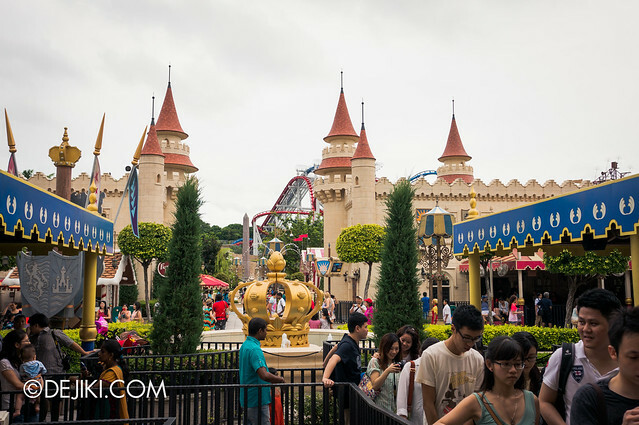 It is a shame, because all other Universal Studios theme parks will have a Wizarding World zone and a lot of people have been asking for this to be built in Singapore! If you wish to see this happen, have your opinions heard at the park’s Guest Services offices or write to RWS and UPR. Realistically, it is likely to be a Shrek (or another Dreamworks franchise) attraction. 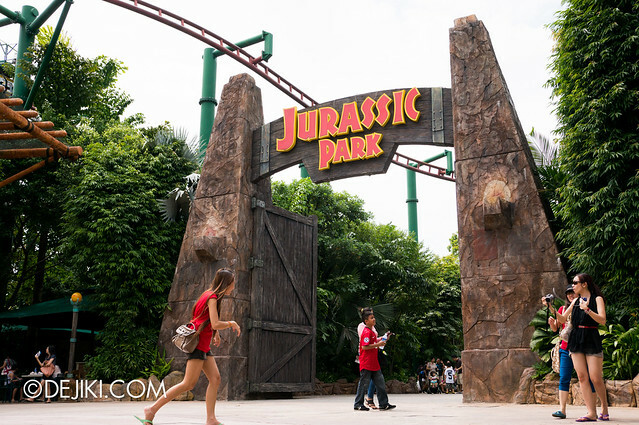 To boost park attendance, Universal Studios Singapore is now offering the Student Season Pass to students age 13 and above. These passes go for S$88 each and can be purchased at the Universal Studios Singapore ticketing counters. Like the Annual Pass, the Student Season Pass is valid for unlimited admission to Universal Studios Singapore during normal park hours (excluding private and special events such as Halloween Horror Nights). The Student Season Pass is valid from now till 30 November 2013. The passes must be purchased before 30 June 2013 (last day of this promotional price). Valid student pass (or relevant credentials) must be shown to the ticketing crew to qualify. The “RWS Attractions Pass” plastic card will be provided to season passholders. Obviously, this is a no-brainer option for all students in Singapore – it is a small top-up from a single day pass! Scare-actor audition dates for Halloween Horror Nights 3 (HHN3) have been announced along with the event dates. HHN3 will run for 10 nights over four weekends. This is a modest increase from the seven days in 2012. Event programme, opening hours, ticket options and pricing will be available in months to come, when HHN3 is officially announced by the park. And if you are auditioning to be a scare actor – Best of luck! Feel free to refer to my posts on past Halloween Horror Nights for reference and inspiration. 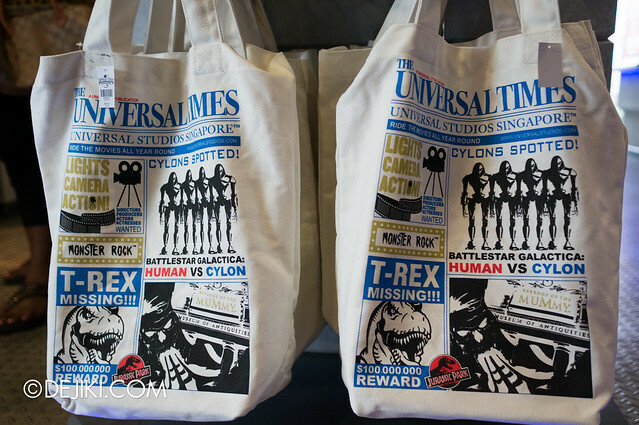 “The Universal Times” tote bags (very similar to Baggu’s Duck Bag). Very interesting. S$26.90. 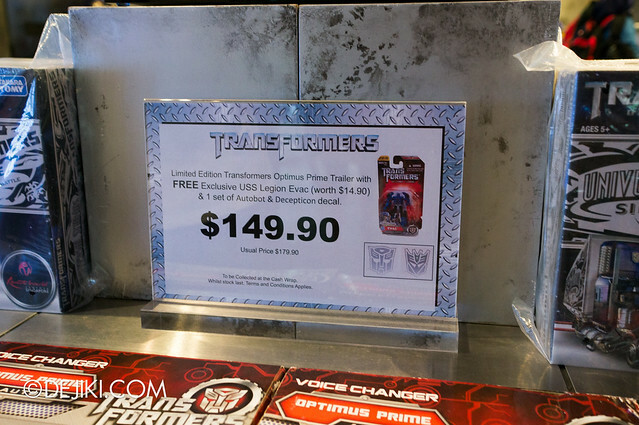 Over at Transformers Supply Vault (Sci-Fi City, beside Transformers: The Ride), the “Limited Edition Transformers Optimus Prime Trailer” is finally on a discounted price of S$149.90. It also comes with 2 free gifts. 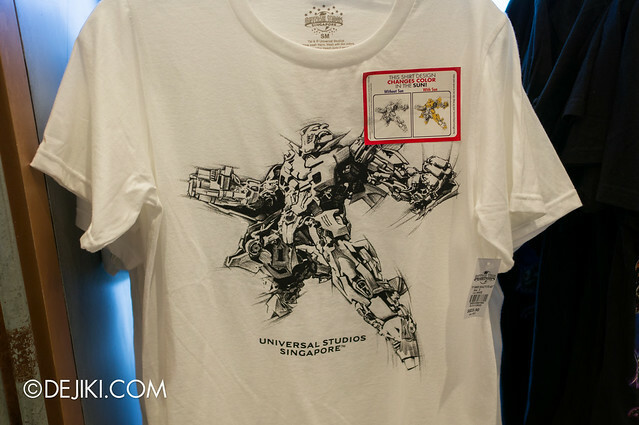 This is (supposedly still) a Universal Studios Singapore exclusive item. 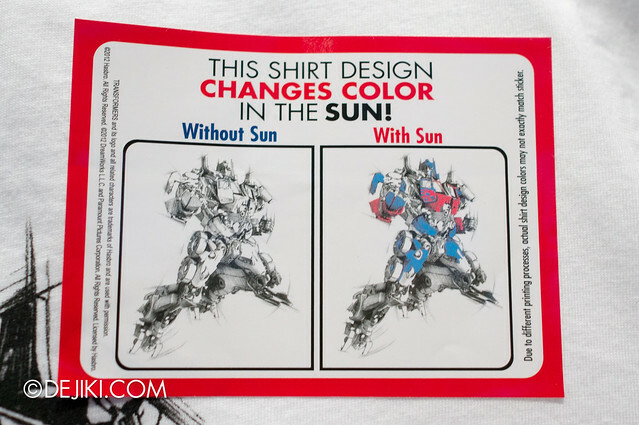 The design on these “Sun Activated” T-shirts transform into colour when exposed to the sun (and possibly anywhere with UV). 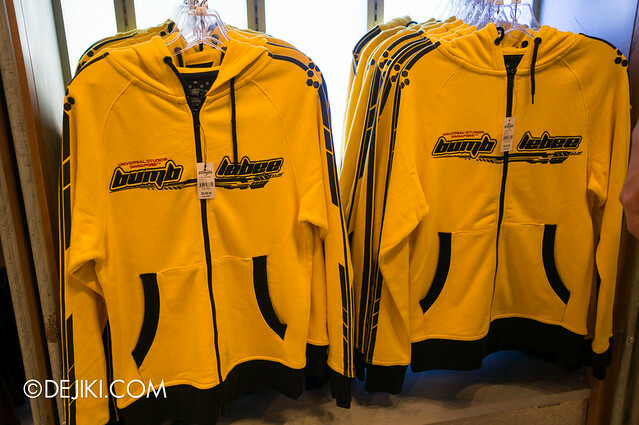 There’s also a Bumblebee design. Both designs available in adult sizes, for S$33.90 each. 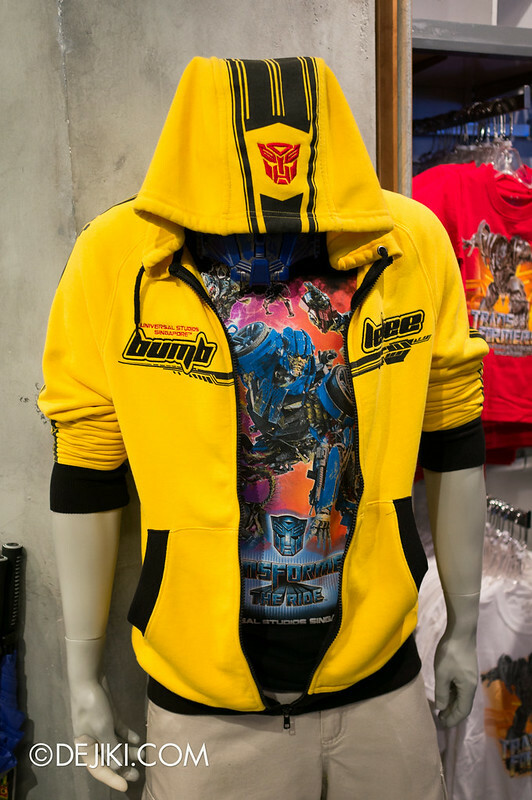 The Bumblebee Hoodie is also spotted at the Transformers Supply Vault for S$89.90. 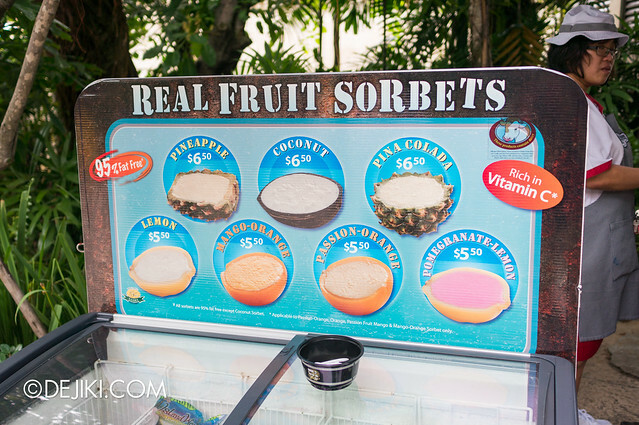 These fruit sorbets are available at some outdoor snack stalls around the park. And that’s a wrap! 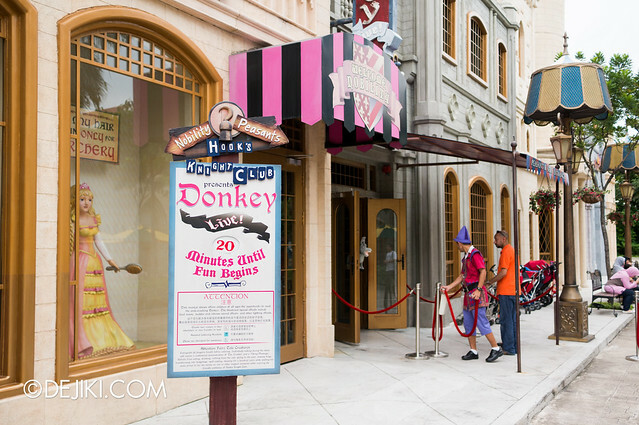 Check back in a while – I’ll be posting a special feature with photographs from all over a specific zone in the park. Have a guess! 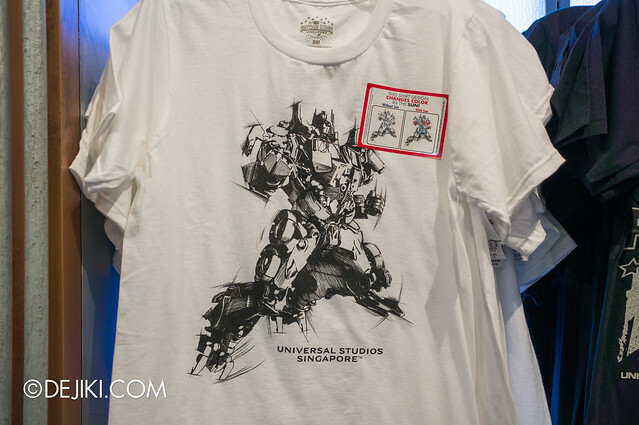 Considering that USS opened Transformers: The Ride at the end of 2011, I’d say the increase in attendance from 2011 to 2012 of just 69,000 is a huge disappointment. Dejiki, what do you think? 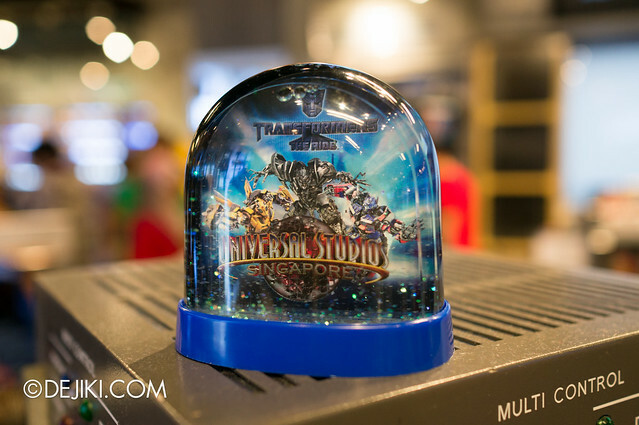 Transformers: The Ride only provided the park with a short-term boost, and that was for that half year period after its launch. Once the same ride opened in Hollywood, the park seemed to have lost momentum until Halloween in 2012. The park directors believes in the “quality” of experience and not the quantity, but in reality, the park lacks quality attractions (by that I mean attractions that are worth another visit). 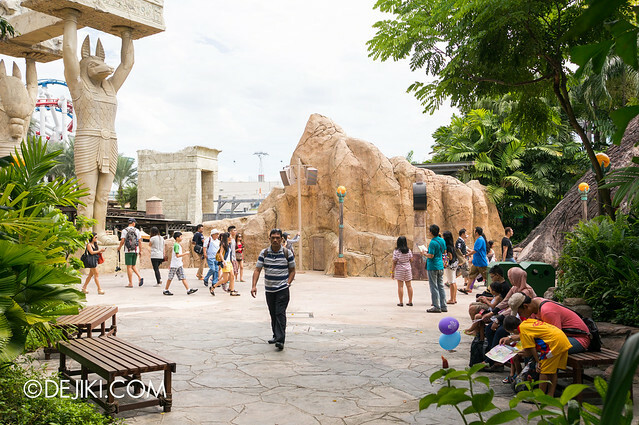 I felt that the whole “family-oriented” approach shoeboxed the park’s potential – look at new attractions in the best parks around the world, and look at Sesame Street in USS. USS needs to play at the same level as the other Universal Parks. Not having Wizarding World (which is soon a standard offering at all Universal Parks worldwide) would already push some visitors abroad/away. Rhythm is another issue – The lack of seasonal events apart from Halloween is just surprising, especially for an established park. I’m concerned when guests plan their visits around cheaper tickets and not wanting to go there for its attractions, but cutting admission prices (while raising prices of F&B and Retail) was the park’s solution since 2010. The thing is, how much can you cut, and how long could you continue to do that? 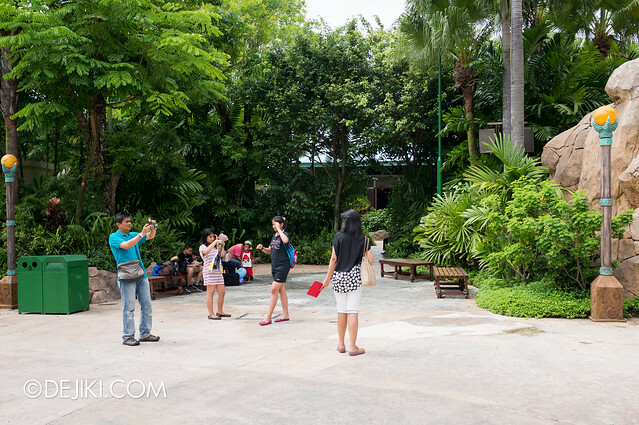 On a bigger picture, the park owners seem to believe that guests visit RWS not just for USS, but Marine Life Park as well. My thought on this is that there is no clear focus or direction, or more like a lack of dedication to build USS as a true Universal Studios park worthy of being on international charts (rather than S.E Asia). The park needs to revamp and expand or the attendance numbers will just dwindle. Hong Kong Disneyland realized their mistake in their early years and managed to make an incredible recovery. Dear Universal Resort World, I read via the web that a wizarding world of Harry potter would be opening sometime around 2017-18 on internet news! If that would be official in the news, would you advertise it in your holiday package flight deals? If that came to be for true? I have a friend who’s a manager at Universal Studios Florida and he confirmed that The Wizarding World of Harry Potter expansion will be included in Universal Studios Singapore. P.s are there holiday packages to Singapore for seeing the Universal theme park places?! I have not been to Universal Studios Singapore yet and I would like to know if it would be fun. I would also like to know if it is worth it to apply for an annual pass. Thanks in advance. You might want to buy a One-Day Pass and visit the park first before making a decision. You can upgrade that ticket to an Annual Pass by paying the balance before you leave the park. If I buy a one day pass and after visiting Universal Studios Singapore, I want to upgrade to the Annual Pass with Universal Express, do I also pay just the balance? And also do I have to upgrade my one day pass to annual pass on the day of visit? Yes, you just need to pay the balance for the type of Annual Pass you wish to purchase. You may upgrade an unused ticket to an Annual Pass, but it would be a lot easier to upgrade on the day of visit inside the park. This is because you can visit the Annual Pass office to sign up and pay the balance at the same time. Thanks for your help! 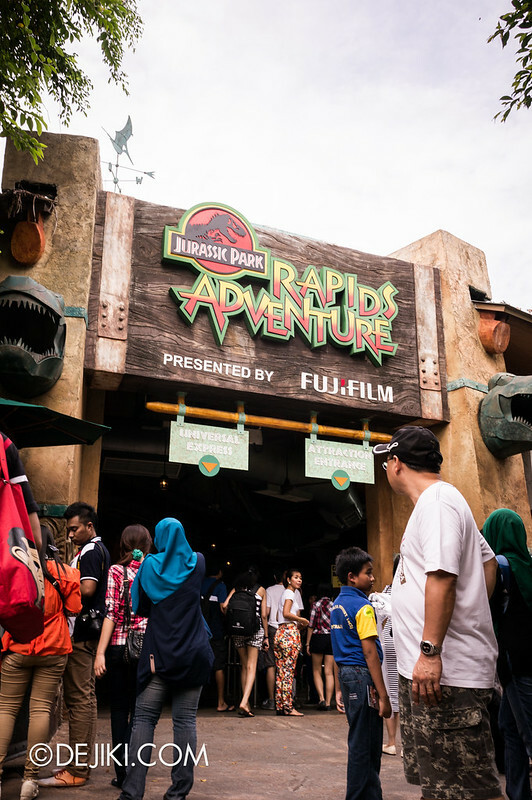 Just one more question, do you think it is worth it to apply for the annual pass with universal express or just apply for the annual pass without universal express since the annual pass is inclusive of unlimited admissions to Universal Studios Singapore. 1. Express Line is still a line, there may still be a wait. In some situations, Express line may be unattended when the park crew members are busy with the other lines. 2. Single Rider Line is available at most rides at USS upon request (basically you enter a separate queue for single riders) which is useful if you visit the park alone. 3. Access to the Express line is an entitlement for the Annual Passholder only. If you visit with friends, they will need to buy their own Express Passes. You and your blog have been of a great help for people like me who have not been to Universal Studios yet. Thanks for your help! You got it right there – Saturday is the park’s busiest day of the week! I would actually avoid that day and go on either Friday or Sunday. From my experience, Sunday tends to be less crowded (but NOT always). Guests leave the park earlier too. In my opinion, the fireworks are not worth the time and hassle of being at the park’s busiest day. Strongly consider visiting on Sunday if you wish to catch the parade. I didnt realize though that the week that I’ll be going to SG is a holiday weekend. That’s Aug 9 – 11. Since Aug 9 (Friday) is a holiday, would you think that out of these 3 dates, Sunday would be my best option to visit the park with “lesser” crowds? 🙂 or should I just change my date and visit on a Monday instead? 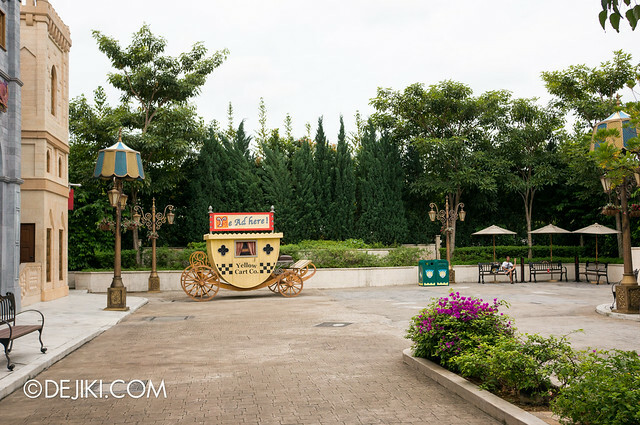 Unfortunately there is no luggage storage at the park or within RWS, unless you are staying at one of their hotels. You can rent lockers outside the park (about cabin size). It’s $20 to $40 for a full day rental.. if I remember correctly. 1. Saturday is definitely a no-no. Holidays or not, it’s the most crowded day of the week. 2. Friday is tricky. It is a public holiday, so more people are able to visit the park. However, there will also be people who would attend the National Day Parade (at Marina Bay) or stay home to watch the live telecast. 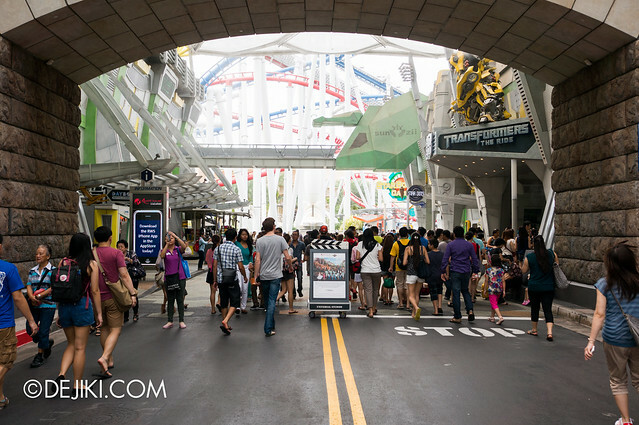 Last year I believe RWS had a special promotion for visits on the national day weekend (cheaper tickets, which naturally resulted in a very crowded park). 3. That leaves Sunday as your best choice. Given the long weekend, it might be more crowded than a typical sunday, but still most optimistic of the three days. Of course, if you could switch to Monday, it would be the safest. I have saw your previous post that you are planning to make a food guide, attractions guide on USS. Do you still have plans to make such guides? I feel that such guides will be really useful for me as I do not need to waste time playing those not so fun rides or eating those not so nice food that is not cheap. Thanks in advance!! There are plans for these guides but not in the near future. I would suggest experiencing all rides and shows in the park to get your money’s worth. As for food – stick to Starbot Cafe, Mel’s Dine-In, Loui’s Pizza Parlor and Friar’s. If you want to splurge, KT’s Grill. 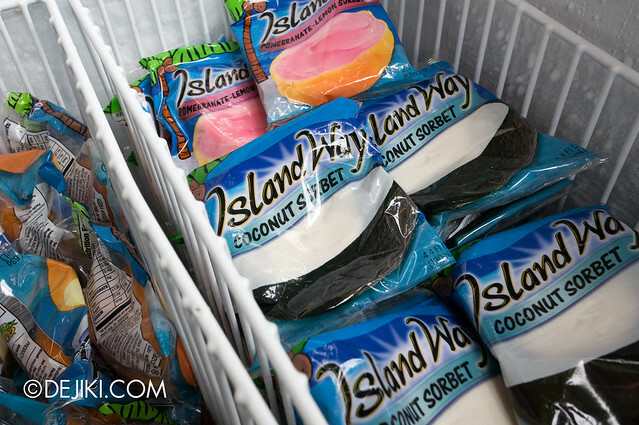 I’ve been to the park very frequently for more than two years with friends and these are the places that we frequently visit for meals and snacks! Thanks for your reply. 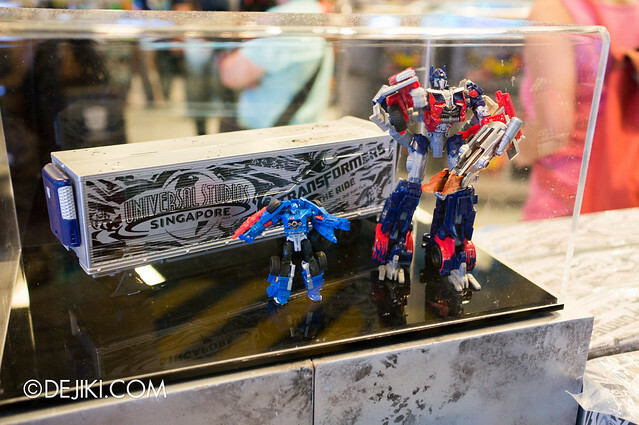 Btw are you also going to make a shopping guide and what things do you think is worth it to buy from USS? Is the food and souvenirs in USS expensive? Do you think it is more worth it to buy the student season pass or the annual pass since the student pass benefits only last till 30 November? I am planning to go down to Universal Studios Singapore with my friend this Thursday, 27 June 2013. Would it be possible for you to suggest an itinerary for us 13 year olds. Thanks! 1. Be at the park 10-20 minutes early and queue up at the gates. Once you have entered the park, walk briskly through Hollywood zone (do not stop for photos) and head straight to the right (towards New York). Enjoy the rides at Sci-Fi City, Ancient Egypt and Jurassic Park first. 2. Some rides tend to have the longest lines, such as: Jurassic Park Rapids Adventure, Transformers: The Ride, Canopy Flyer and Battlestar Galactica. Take advantage of being early at the park to go on these rides without waiting too long. 3. Try to go on Battlestar Galactica in the morning or later in the evening, so that it isn’t too hot and sunny. 4. Leave the rides at Far Far Away, Madagascar and New York (Sesame Street Spaghetti Space Chase) for later in the afternoon, or when you need a break from the high-speed rides. do i have to bring a torchlight to HHN 3? are the rides still operational at night? which scare-zones are the best? what are the haunted houses inside the park? I would just like to know if there are anymore HHN3 auditions going to happen? Im 15 and would love to audition and i have my parents full support! The HHN3 auditions were only held on the two days stated. However, you can try sending an email to RWS (ussaudition@rwsentosa.com). Good luck! Just wondering if you would know when USS will make the official announcement for HHN 3? Should be this month right? The park should announce full event details sometime next week. Hey thanks for your very good updates and reports on USS. I absolutely love going to USS. I’ve been there 4 times already. Now I’m looking at investing in an Annual Pass that costs $188. This means that I can go in as many times as I want to in the span of a year, starting from the day of purchase. Really good deal I reckon. However I’m not sure if I can get discounts from VIP tour. I would like to try being in a tour and feeling like a VIP. 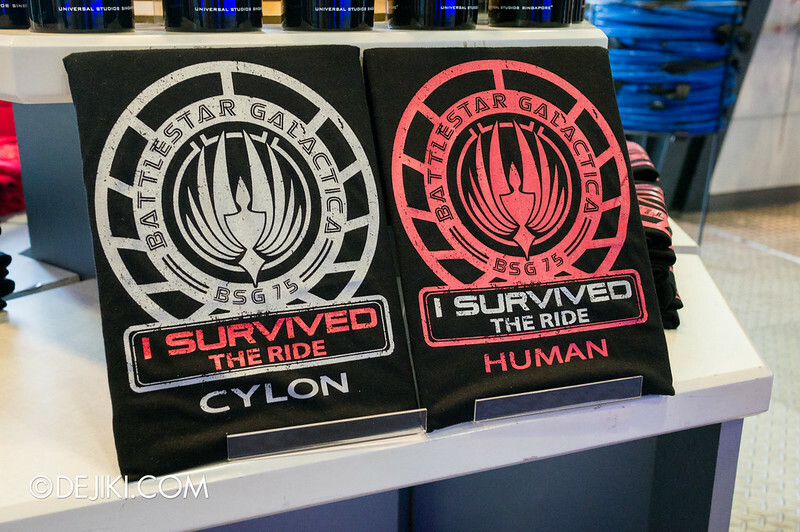 Not that it will help me overcome my fear of the Cylon (haven’t plucked enough courage for that ride). But I’m sure it will allow access to photos with some of the park’s characters. I’ve had shots with Marilyn, Frankenstein, Ernie, Cookie Monster, Elmo, Charlie Chaplin, Beetlejuice, Puss In Boots. But there’s still the elusive Panda, Shrek, Princess, and the cast (or at least some of the casts) of Madagascar. Perhaps the VIP tour can get me access to these elusive characters. How about food at the park? What do you suggest? I know it’s a bit costly, but I’m sure with my Annual Pass (or at least when I eventually get my hands on it, most likely during the national day long long weekend), I can go in there for meals… as and when I like. No rush to ride on anything or take photo with anybody… cos I can go back again, and again… with the Annual Pass. What is nice to eat there? A 20% discount for the VIP Tour was offered to Annual Passholders in the 2010~2011 Programme. I’m not sure about the current entitlement. However, I would not suggest getting the VIP Tour to access these characters, because not all requested characters are not guaranteed to appear. You will have a better opportunities – more private photo taking spots, no queues or people walking around. Since you’ve decided to get an Annual Pass, it will be easy to take photos with all the park characters. Just be at the park early and ask the park crew about the characters’ appearance schedules. Thanks for your advice. The VIP Tour is only icing on the cake. No need to rush that one. You mean that they are scheduled?! Nice… next time I will request for the schedule. Do you have the schedule to share with us in your blog? Yes, the character appearances are scheduled, but because the park does not make it known (apart from vague timeslots), it becomes more of a random encounter. For Sesame Street characters, they will appear for photo ops right after a street performance at New York, so just keep track of their show timings and hang around after a show. I guess once I get the Annual Pass, I should have time for specific encounters, planned experiences. No need to rush through all the areas since my pass allows repeat visits at my own time. Hey sorry for all the questions and bother, but do you know if Annual Pass holders will get discount for Halloween Nights? I’m a bit timid in nature, but I won’t mind attend HN3 just for the thrills… and if there is discount to obtain from Annual Pass membership, even better huh! So when’s your next visit to USS? I’ll be popping by tomorrow to get the Annual Pass. Hope to bump into you some time soon. For the past two years, Annual Passholders were entitled to a discount for Halloween Horror Nights – I believe it was 33% off. The park is expected to make an announcement on various discounts and pricing details sometime next week. I’m not sure when I’ll visit the park again, but it’ll be nice to meet up sometime! Hey by the way, do you know if the Hollywood After Hours Party (with the all you can eat and drink) event is still on? Do you think it will be an event for the national day long long weekend? It would be nice to have that happen… eat and drink and get drunk in fun park USS! WEEEEE! Started this blog to post my experiences at USS. I hope to swell it to be like yours. Although I must admit, you have put in a lot of research into the specifics. I am only just starting my journey to be acquainted with USSg. Let me know if there is any chance we can meet up or perhaps it there’s an angle you would like me to cover. My interests is now in the Park food, the various restaurants and meals available (I especially enjoy the diner. Cos I love burgers). I will be obtaining the annual pass this Saturday from USS in-person. I hope the process is smooth and my fun can start from then on.